Crushed tomatoes with basil leaves, salt, pepper. Suitable for vegetarians.Crushed tomatoes with basil Peter travelled to Italy at harvest time, securing the sweetest sun-ripened tomatoes to be crushed into sauce within 12 hours of picking. After seasoning with salt & pepper, the finishing touch was a fresh basil leaf added to every can, something the Grecis still do today. 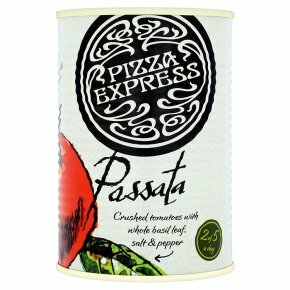 You can use our passata in sauces, casseroles, soups and on pizza.